People with rosacea flush easily and can develop redness, pimples and thread veins on their cheeks nose and forehead. It usually starts in the second or third decade of life, it affects about 10% of adults. 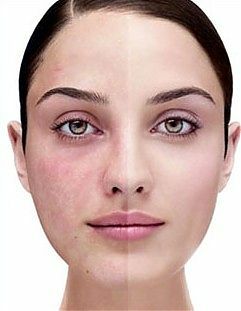 Because Rosacea affects the face it can cause significant psychological problems. The unpredictable flushes can cause a lot of embarrassment and anxiety. Flushing is exacerbated by hot spicy foods, alcohol, sunlight, extreme environmental heat or cold, and certain cosmetics. The active flare ups when spots break out are best treated with antibiotic creams or tablets. IPL lasers are used to treat the redness and broken veins. A broad spectrum of light is transmitted through a small, smooth, transparent handpiece which is gently placed over the skin. Cut-off filters in the handpiece change the wavelength range allowing it to be optimized for different applications and skin types. The light penetrates the tissue and is absorbed by either the blood when treating vascular lesions or the melanin when treating pigmented lesions damaging them. The body's natural processes then remove the injured tissue giving the skin a more even and youthful appearance.